Clients enjoy agility so much that we are continuing with the day time classes until it becomes too wet and cold to continue. The weather however was kind for the end of season evenings when we played games and held BBQs. We are planning to design a course called Ourway Combi. Combi will be a mixture of agility, parkour and of course some obedience. I will let you know how this develops but at the moment people seem interested very keen in giving it a go. 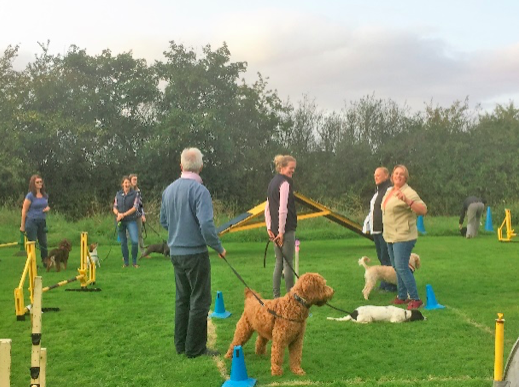 The Gun Dog Training classes have become very popular and we hold the classes in various places to make sure the dogs can use it skills in different environments. Twice a year we arrange for our clients to take the Kennel Club Good Citizen Awards and this will take place on Saturday. There are three level of awards, Bronze, Silver and Gold each award having a higher level of obedience. We have over several weeks been practicing to ensure that the dogs are ready to be tested. However, it does not matter how much we practice the owners can become quite nervous on the test day which unfortunately the dogs can react to. Hopefully they should all pass but I will let you know. 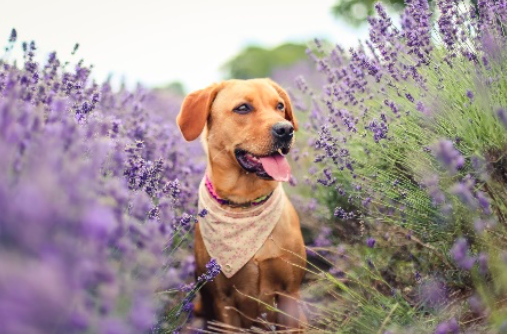 As several of my clients continue to come course after course it does become increasingly difficult finding them something new to train their dogs to do. Over the past few months I have been designing games to use in my lessons around building up the relationship between the dog and owner so that the dog will focus more on the owner because they represent fun and excitement rather than be more interested in the environment and not the owner. These games certainly seem worth doing especially at the beginning of a class as it encourages the dog to get into training mode. Next year Ourway will be celebrating 20 years of being in business. We recently held a Photograph Competition of owner’s favourite picture of their dogs. The winning photograph will appear on the cover of our Calendar for 2018. The winning photograph is of Polly who comes to agility. The Calendar is part of Ourway celebrating 20 years. We will of course be sending you a copy of the Calendar. Kima wanting to do everything that Woody does!! We are nearly coming to the end of our season for evening classes of Agility. The weather has certainly made it more challenging to hold classes. We have experienced extreme weathers this year from rain storms to heat waves. If it rains too much it can be dangerous not only for the dogs but owners so I set up courses where no contacts are used and minimize the twisting and bending of both dogs and owners. We have a canopy to stand under while you wait for your turn. As you all know England is renowned for wait weather so I am used to making contingency plans. However this year we did have a couple of weeks where we had extreme heat and some of the dogs were really suffering from the heat. It was difficult planning classes that was suitable without the dogs having to run too much. Have you noticed how some clients are late in calling out the cue/command? Dogs are adept in thinking about the next obstacle ahead so they are in mid-air when the owner calls out ‘jump’. To prove this point to the owner we asked the owner to run the course without the dog whilst calling out the commands. 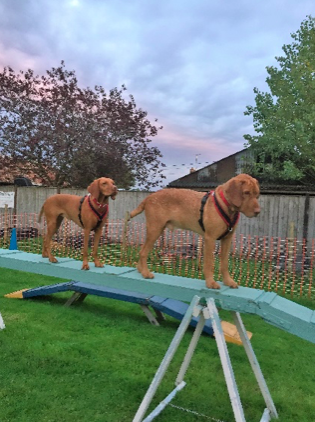 A video was taken of this and replayed to the owner so that they could see the position they were out and expecting their dog to manage the obstacle. This was a good fun way for the owners to improve their agility while minimizing the exercise of the dog in such heat. We always end the year with a BBQ so we are hoping this is not spoilt by our English weather. I will let you know. I have a special group of Vizilas doing agility. The photograph shows to house mates sharing the Long Walk. This was particularly interesting as Woody lacks confidence and decided to do this on his own followed by Kima. Ourway Dog Training was asked if we could organise a Dog Show for a small village Summer Fair on the 10th June. These shows are for people with pets to have the opportunity to show their dogs. They are completely for fun with the name of the classes such as ‘Most Handsome Dog’, ‘The Dog the Judge Would Like to Take Home’ or ‘Scruffiest Dog’. We also set up a small agility course for people to have ‘a go’. Of course, in England we cannot rely on the weather!! Having had a week of rain and wind we woke on the 10th June to a morning of sunshine however, it still was extremely windy. 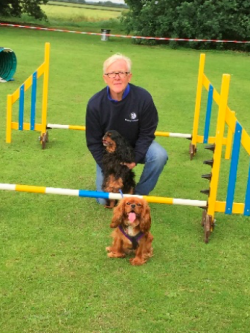 Henry set up the agility course in the morning so that we ready for when the show started in the afternoon. We had a lot of people bring their dogs and enter the show and have ‘a go’ at the agility. There were young children, couples and older people that wanted to enter their dog in the Show and there were a varity of dogs from Wire Haired Dachshunds to a Deer Hound called Hildie. It was so windy that it was difficult to stop the entry forms and other paper work from blowing away. The show was a great success with many happy proud owners returning home with their dog wearing a rossette. 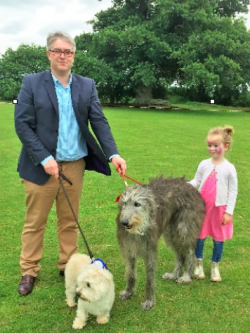 In the photograph you can see Father and Daughter with their winning dogs for the Most Scruffiest Dog. In fact the daughter Eloniese, came into the ring walking Hildie the Deer Hound who was an absolutely lovely chilled out dog.